In principle, I like this idea of always being 100% present with my daughters or 100% ignoring them while I get work done (thus teaching them to develop their own self entertaining skills), but in reality, as a work-at-home parent, I know living this attention dichotomy is impossible. First of all, I have a one-year-old. Anyone who thinks they can 100% ignore a 1 year old for any extended period of time has little grasp of reality. Nora, at four, is pretty good at playing on her own. She’s even turning out to be a decent entertainer for her little sister. But leave Zara to her own devices for more than 15 minutes (or maybe just two, depending on the day) and an entire roll of toilet paper will be shoved into the toilet or all six of the unripe peaches sitting on top of the dining room table will have little nibbles taken out of them or an entire bookcase of books will be littered across the house or…worse. 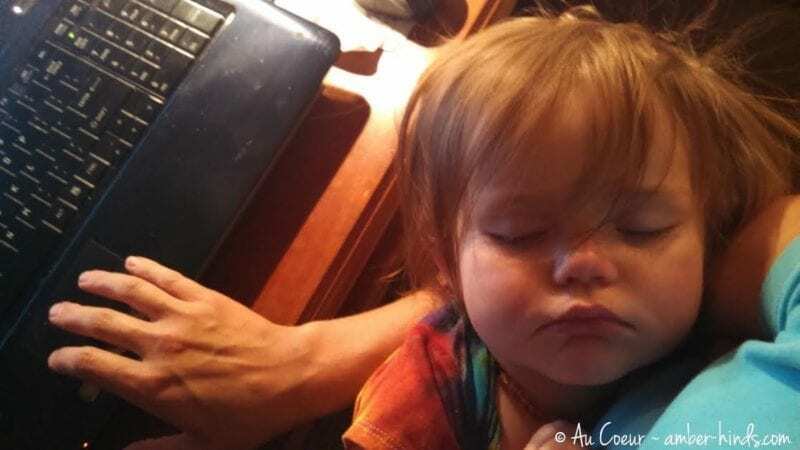 The reality of being a work-at-home parent with no childcare is divided attention. It’s checking email on my laptop while we eat breakfast together, then taking a break to button dresses, braid hair, and change a diaper before setting out a few toys and praying for 30-40 minutes of uninterrupted work time. It’s breastfeeding during phone calls in an attempt to keep the baby quiet or watching in horror from across the room as the sofa is drawn on with a ball point pen while I try to sound focused and professional on the phone. It’s alternating reading a page in a board book with typing a line of code and, yes, sometime it is pushing two little people in the swings at the park while responding to texts from clients on my phone. Being an small business owner of a sole proprietorship means not being able to hand tasks off to someone else. Being a stay-at-home mom to young children means not always having the luxury of dedicated interruption-free work hours. It takes a lot of time management and a lot of multitasking to work 30 hours per week when most of those hours are also spent caring for two little ones. It can be hard to read blog posts or news reports about the detriment to children of having parents who are always plugged in. I do occasionally feel guilty when Nora is trying her best to be patient while I have finish something up; I worry about being judged when I have to respond to a client email while we are at the playground; I hate that there are times when I load Zara up with snacks as a means of buying a few more minutes of computer time. I don’t like any of that, but when it comes down to it I wouldn’t change a thing. If given the choice, I would always choose divided attention over no attention for my girls, because in our world divided attention means that I get the honor of pushing them in the swing while I check emails. I’m not paying someone else to care for them while I wonder what they are doing. Multitasking between work and children means that my girls get to spend their days with me instead of with a babysitter. And when I start to feel guilty about them having to share my time, I remind myself of what it was like when I worked full-time out of the house and Nora spent 8+ hours per day with a sitter. As great as our sitter may have been, she wasn’t mom or dad. So forgive me if I just can’t buy the argument that no attention is better than divided attention. Surely 4-5 hours per day of mom’s distracted attention is better than 8 hours per day without mom at all. I do think it would be easier to do what she is saying with older children, but she also writes about doing it with younger children (providing the example of sleeping on the couch while they play). To me, though, no matter what age the children, divided attention is unavoidable if you work from home. I would imagine that it is easier to segregate time when kids are in school all day, but only in an ideal world could I imagine that school hours would be the only hours I would work. Realistically, working for myself is always going to mean some work hours while the girls are around. This is a good article, Amber. I appreciate also that in generations gone by, small business owners had their kids working in the shop. The nature of how we conduct business has changed, and consultants don’t have (and haven’t ever had) the luxury of hiring the kids to help out in the office. Time and time again, I go back to how completely isolated modern American family culture is. There is no village. No extended family living in a compound/neighborhood. It’d be nice if the mom bloggers of the world (who seemingly have it all figured out) spent more time volunteering to help families in need of childcare instead of writing about how flawed the working mom of today is! Thanks, Marnie. I think you make a good point about the historical perspective. It maybe email and cell phones now, but in the past it was housework that took mom away. Of course there should be moments when children get undivided attention, but to expect divided attention to never happen is just as unrealistic now as it was 100 years ago.